“New dimensions in the mobile crushing technology“, was the statement of many customers when they saw the new R1000S at the first time. Rockster is now presenting with the R1000S a worthy follow-up model of the track-mounted impact crusher R900 – with more technical features. New mobile crushing and screening is entering the market. Mikael Karlsson reports. Mobile recycling equipment is an efficient choice for demolition contractors when the location of the waste for recycling changes regularly. There are many manufactures of mobile equipment that improve on-site recycling performance. Mikael Karlsson reviews some of the latest equipment. 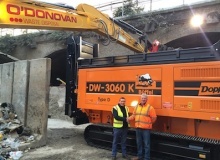 In the UK O’Donovan Waste Disposal is one of London’s leading independent waste management and recycling companies. To enhance its waste processing and recycling capabilities the company purchased a Powerscreen Powertrak 750 mobile screener, Doppstadt DW-3060K mobile shredder and a Marathon 250 two-ram baling press with a BlueMAC feeder from Blue Machinery London. Destroyer 1113 at Kim Vind The new 49t Keestrack Destroyer 1113, with a secondary screen, has been deployed in the recycling process at Danish company Kim Vind Maskinstation and Entreprenør since the summer of 2015. Supplied and supported by dealer TNS Imex in Løgumkloster, the Destroyer 1113 with the secondary screen unit and recycling conveyor is easily and quickly transported to any location. The Belgian company Keestrack unveiled the new 43.5t Giant diesel electric drive screen at the recent Matexpo Trade show. 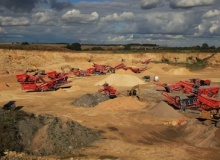 Red Rhino, the British manufacturer of mini crushers, has added the Red Rhino 7000 crusher to its extensive range. The Austrian crushing and screening plant manufacturer Rockster Recycler recently staged an open day for its international dealers at its Ennsdorf factory to coincide with the company’s 10th anniversary. 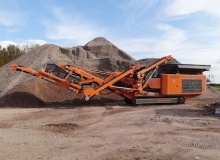 Dutch contractor Grondverzetbedrijf purchased a Rockster R1100DS impact crusher earlier this year from dealer Ophof Recycling with the aim of considerably boosting production. 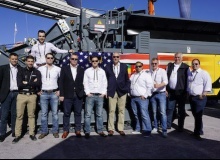 The purchase of the first Rockster R1100DS crusher in Holland followed demonstrations in Austria and visits to existing Rockster customers. Crushing and screening equipment manufacturer Terex Finlay used a customer open day in September to introduce new models. Sandvik Construction attended Demolition Expo 2015 in the UK, held in conjunction with the National Federation of Demolition Contractors at J. Mould’s site near Reading. 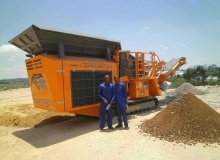 In South Africa Rockster dealer Mfangano Solution is working with municipalities and contractors to deliver the right recycling machinery, at the right price, with the best environmental performance. 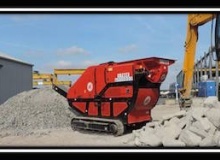 With the implementation of RM RENTAL, RUBBLE MASTER presents itself as always as a pioneer. The company already began to set up a rental fleet ten years ago in Austria. The success shows the decision was right: RM rental fleets have become established not only in Austria, Switzerland and France but also in other European countries. RM sales partner Thierry Venturini gave an insight into how the French RM hire business is progressing at the press meeting. RM RENTAL, like the RM umbrella brand, stands for simple and profitable solutions. 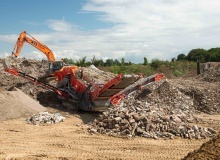 Rubble Master launches rental concept The Austrian manufacturer of compact mobile recycling and screening units, Rubble Master, used Intermat to launch a new concept. With the implementation of RM Rental, Rubble Master presents itself as always as a pioneer. The company began to set up a rental fleet ten years ago in Austria. In 2012 62% of construction, demolition and excavation waste in Europe was recycled according to a recent report from Frost & Sullivan. CDE Global head of marketing Peter Craven argues that rather than demonstrating success, these targets are making wider problems in the CD&E waste recycling sector across Europe. Equip2 Processing Solutions has supplied the first Rockster R900 in New Zealand to Mulching, Crushing and Screening Ltd. The machine already looks set to add speed, precision and flexibility to the company’s machine fleet. Barry Maunder and Gareth Fryer from Mulching, Crushing and Screening Ltd (MCS), situated in Napier / New Zealand, are firm believers in reaping the rewards of sound technology through plenty of research. The company Peyret Ferrer in the north east corner of Spain have there main focus in farming machinery rental and had many requests for crushing excess rocks, left on the fields as they were cleared for harvest. 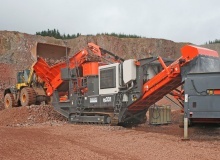 Peyret searched for a solution to process these boulders and bought a Duplex R800/R900 jaw/impactor crusher. Resource efficiency targets were in the centre of attention at the Construction Material Recycling in Europe congress (EQAR) held on 8 May 2015 in Rotterdam, The Netherlands. EU Commission DG Environment representative Josefina Lindblom said in her report that the EU Commission pursues the aim to reduce the environmental impacts of buildings throughout their life cycles. For this aim European assessment tools and guidelines have to be developed and applied. Furthermore an increase in using recycled construction materials in the construction and maintenance of buildings is recommended. This will contribute to improving functioning of the market for recycling, construction and demolition wastes. In the UK the waste recycling and management contractor Murray Browns, based in Flixton, North Yorkshire, asked BlueMAC to come up with a solution for a new bespoke materials recycling facility system. The ever increasing volumes of commercial and construction and demolition waste materials that are being recycled required a new recycling plant to replace their old small recycling plant.